Paestum was probably founded around 650 BC by a large group of Dorians who had been expelled from the city of Sybaris, a luxurious resort across the mainland on the Ionian Sea. The Dorians named their new colony Poseidonia, after the most important of their gods; it flourished and quickly became the greatest city on the gulf of Salerno. In 390 BC it fell to a tribe of local barbarians called the Lucanians. In 273 BC, the Romans arrived. They changed the city’s name, but we know as little about Roman Paestum as we do about its Greek predecessor. In 79 BC, the eruption of Vesuvius partially destroyed it. Perhaps it was volcanic ash that helped to silt up the mouth of the river on which the city stood; this led the surrounding countryside to become swampy and mosquito-ridden. Christianity arrived slowly, leaving some traces of its presence in the Ceres Temple, which was turned into a burial place for the Christians themselves. In the 9th century AD, the town of Agropolis, near Paestum, was taken over by Saracens. These Muslim Arabs introduced such delicacies as pasta and buffalo (source of the exquisite mozarella di bufala), but they were also such fierce fighters that they soon became as dreaded as the malarial mosquitos. 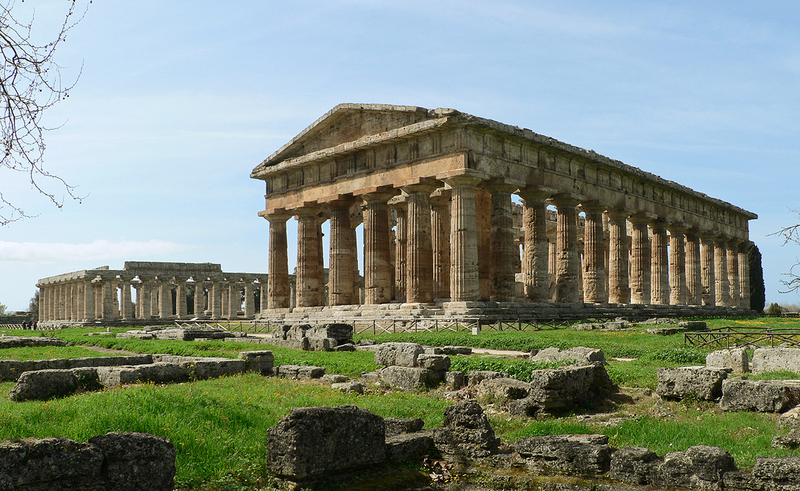 By 877 AD, the inhabitants of Paestum had abandoned the city and retreated to the safety of the nearby hills. Incredibly, although Paestum’s Temple of Hera (also called “of Poseidon”) was among the most famous cult-worship sites in antiquity, and although it is the oldest, best preserved and most beautiful Doric temple in existence today, these majestic ruins were unknown all through the Middle Ages and the Renaissance. They were discovered just in 1740 and not accurately described until 1779. Mozzarella di bufala campana (PDO 1996) is a particular type of mozzarella, made from the milk of water buffalo raised in designated areas of Lazio and Campania; some consider it the best for flavour or quality. Fior di latte (written also as fiordilatte) is used to distinguish the mozzarella made from cow’s milk from that made from buffalo’s milk; when twisted to form a plait it is called treccia.